I had absolutely no idea what story the newscasters were doing at the time I found them about to go live on the air. I support the banning of the Department of Homeland Security (DHS) cameras. 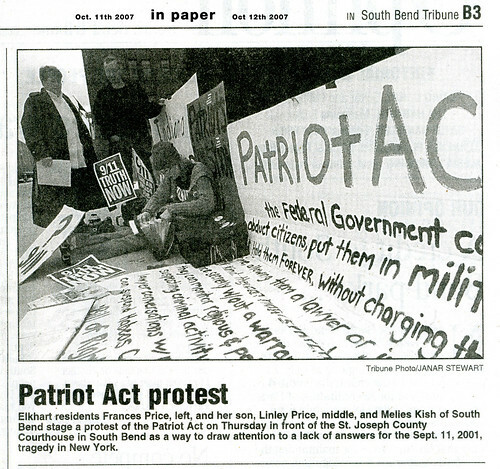 South Bend Indiania's October 11 action in the South Bend Tribune - Thanks Melies! I'll be introducing Marines For 9/11 Truth on Deadline Live with Jack Blood today. First off, thank you all, for what I learned of each person's bold responsibilities they have taken for this movement. I have nothing but gratitude for everyone. Call In May 11 Action Reports All Day 1-512-646-6445 for broadcast on tonight's Truth Revolution Radio. Massive media contact list - use it today! 5/11/07 will stand for 5+ years since the horrendous acts on 9/11/01, we as CHANGE will not stop until the truth behind 9/11 comes out. We will meet in the Streets each 11th and stand up for truth and justice. Cosmos and Luke report on May 11 actions for truth and justice from around the world. Luke on Truth Revolution Radio talking about the basics of getting started in 9/11 truth activism. Luke comes on in the third segment of the first file, 17 min in on the second. Take Action on May 11! Tired of a complicit corporate media getting away with mass murder? Let Them Know It's Not Going to Be Business As Usual Any Longer! High visibility actions are encouraged wherever you are on May 11. Make video, take pictures, represent for 9/11 Truth!